ICFF is known for being a High End Furniture Fair that showcases the latest and greatest furniture, finishes, and lighting from all over the world. This last May was my first trip to the fair and now I wonder why I haven’t gone every year. Practically every manufacturer, designer, and product I admire showcased there and it was such a treat to see it all in person. As a specifier of furnishings and lighting, I believe that products are understood so much better when seen in person. Scale, quality, craft, and detail can be realized only when seen in person. And that’s exactly what I was able to do at ICFF. The show itself was at Javits Convention Center, NYC’s HUGE convention space on the Hudson. However, some of the best showcases were dotted throughout the city as part of New York’s Design Week. One of these treasures was the design gallery NEXT LEVEL. 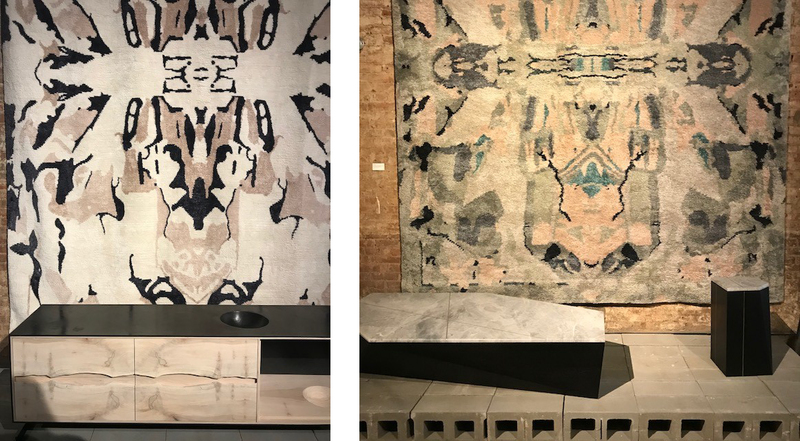 A handful of NYC contemporary designers (Asher Israelow, Eskayel, Hart Textiles, Here Projects, Patrick Weder, and others) curated a large gallery space in NoHo that blurred the line between furniture exhibition and art gallery. The furniture was crafted to a high level of artistic expression and it was a treat to discuss inception and procedure with the artists themselves. I had picked NEXT LEVEL as a must see because of wood worker Asher Israelow and leather artist Brit Kleinman (of AVO). Asher takes brass inlays to a new level, creating brass constellations in wood table tops and brass rivers in dressers. He collaborated with AVO, an artist of printed leather rugs and tiles that I’ve used in past projects, on a low slung walnut chair with painted leather upholstery. Patrick Weder was a new find for me. His wood and concrete credenzas were insane! Hand carded concrete molded perfectly into beautifully crafted wood credenzas and turned simple furniture into art pieces. It’s wonderful to find new artists and designers and Patrick Weder is one I hope to use in future projects. Another fun find at NEXT LEVEL was Kin & Company, a collaboration between two cousins (get it? Kin?). I had the pleasure of talking with co-founder Kira de Paola about her whimsical side tables and mirrors that are the exact products that can add so much life to an otherwise neutral and “safe” design. I’ve been liking the half circle shape and I saw it reflected frequently in Kin & Co’s work – a beautiful balance between architectural and decorative. Since it was Spring in NYC, I took advantage of the beautiful weather and walked from NEXT LEVEL in NoHo to my next destination – SoHo. 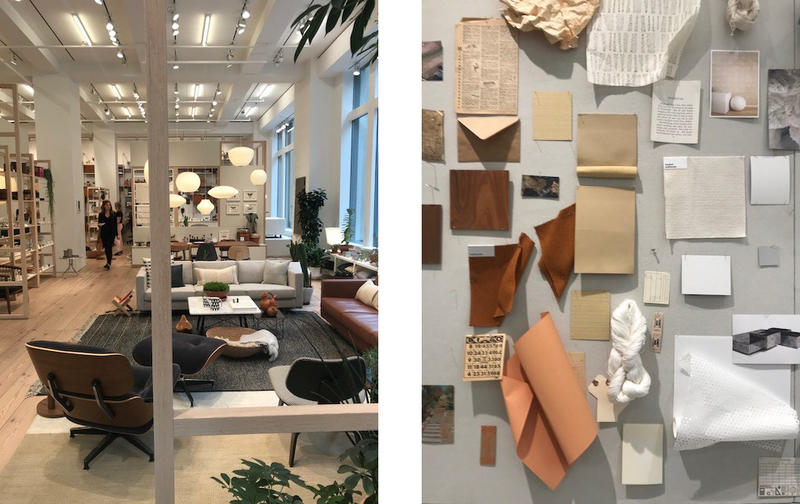 Not only were there multiple New York Design Week pop-ups throughout SoHo, it was a thrill to see other stores and spaces that just had great design. One of these spaces is the Rachel Comey flagship store designed by Elizabeth Roberts and Charles de Lisle. My idea of heaven is where architecture and fashion come together! Lately, I’ve been a huge fan of terrazzo and the store used a concrete version on the floors. The store is located in a former mechanic’s garage, so a bit of the industrial flavor remains in the steel store front and some heavy timber. Those items, plus the terrazzo and the addition of board form concrete walls highlighted by soft natural light from skylights above, create an idyllic serene setting that highlight the clothing on display. The first night consisted of party hoping in SoHo, starting with the Boffi/DePadova showroom, organized by our friends at DZine here in SF. 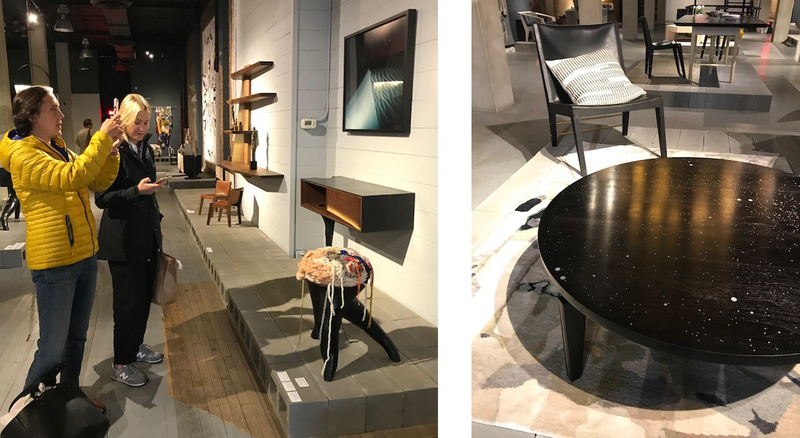 Boffi is located right in the middle of the design district of SoHo, so I was able to stop in at many more design store happy hours from there, including Artemide, Ingo Maurer, Lee Broom, USM, Foscarini, Tom Dixon, RBW, and Kartell. The next day was another off-site design stop, this time at the Radnor curated apartment in The Bryant, David Chipperfield’s new residential tower. Upon arriving I was thrilled to see even more terrazzo! Tons of it! David Chipperfield used concrete terrazzo panels on the exterior and interior walls. The terrazzo was gorgeous, with large aggregates of marble and stone in them. Plus, Radnor’s curated rooms were the perfect complement to the stunning apartment. Radnor is a new company formed by the amazing Susan Clark who has a total knack for finding amazing artists and designers and taking them under her wing to curate a showroom of beautiful artists. Radnor currently represents about 11 designers, only a couple of which I knew (Pelle, Egg Collective, and Workstead I’ve used in past projects and am a huge fan of all three). Su is a kindred spirit in terms of the design world. I could easily sense her excitement about each of her designers and that excitement transferred as she spoke about each one and told me their story. I even got to meet one of her designers, a fabulous woodworker name Adam Rogers, whose work celebrates the construction of furniture in its design. I could have wandered around the city visiting off-site exhibitions all week, but I needed to focus on the actual ICFF fair itself! I thought it may be dull compared to the amazing exhibitions I’d seen so far, but I was wrong. It was amazing to see so many of the brands and manufacturers in-person that I usually only view online. I got to say hello to the folks at Brendon Ravenhill, who supplied most of the decorative lighting for our new office, make new connections at Concrete Collaborative (from San Clemente, my old hood! And they have gorgeous concrete terrazzo!! ), and learn about new-to-me designers and manufacturers (Larose Guyon, Hinterland, CVL Luminaires, Sollos, Empire rugs, District Eight, Ercol, I could go on and on!). I loved talking directly with the designers themselves and just seeing so many products in person was a huge treat. Another wish list item for me was to visit Bec Brittain’s showroom and studio. Bec is a lighting designer, originally from Lindsey Adelman’s studio, and now very much successful in her own eponymous line. 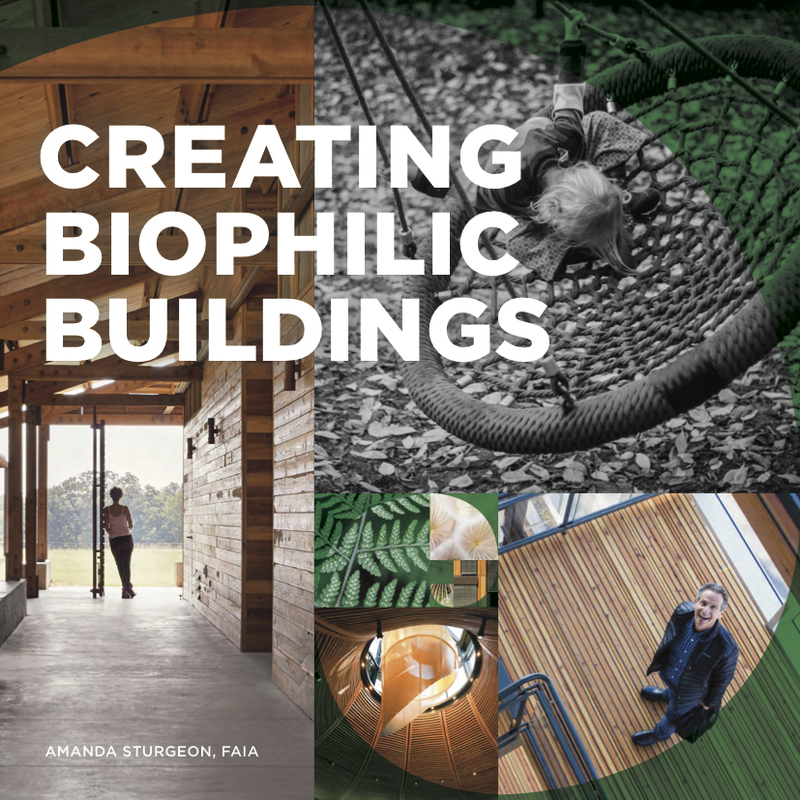 Each line of fixtures from Bec Brittain feels like individual art pieces, yet I’ve been able to use them in many projects without them looking out of place or too precious. Bec opened her studio for NYC X Design Week and showcased a collaboration between her and John Hogan, a glass artist. I was blown away by their new line, ‘Aries’, where Bec’s lights shown on John’s glass pieces in such a way that each piece threw off rainbows of color, looking different depending on your point of view. Again, her pieces are super fun without crossing the line into gaudy. Her showroom is also her working studio, so I was able to see prototypes, items used at special installations, custom pieces, and all the baubbles and shiny pieces that get crafted into one of Bec Brittain’s fixtures. I continue to be a super fan of hers! Many of our SF reps were busy at ICFF too. I got to meet up with Anne Luna from CRI San Francisco to swap stories about what we’ve seen and liked. I attended a cocktail party thrown by Jenne and Adam from Jak-w at the Bolon flagship, which was great, not only because Jenne and Adam are the best, but because I finally got to see the vinyl carpet they’ve been raving about. One night, I was invited to attend a dinner hosted by a favorite of mine, Muuto. The dinner was held in a large space on the 4th or 5th floor of a downtown building that was completely furnished in Muuto sofas, chairs, lights, rugs, etc. As a big fan of Muuto, I thought the place looked awesome. And in a classic NY moment, the dinner was being prepared by nineteen-year-old Flynn McGarry, the boy wonder chef who just opened his own restaurant on the Lower East Side. He has been written up in the Times on a couple occasions, and he’s a bit of a phenomenon, so that made the dinner even more special! Only in NY. On my last day in New York, I got to meet up with our SF Herman Miller reps at their flagship store. Not only is the store home to the Herman Miller NY offices, it also is home to Maharam. We were treated to a champagne breakfast and then given a $100 golden ticket to spend on anything in the store on the street level. The store itself was super interesting. For each season, the curators make up a family and give them personalities, jobs, interests and use those stories to craft their displays. I forget their entire story, but it was a fun concept to think about while browsing the store. I picked out a Jaime Hayon vase that uses the Japanese flower arranging technique, Ikebana. It’s beautiful and I’m pleased to own an item from a designer I admire. 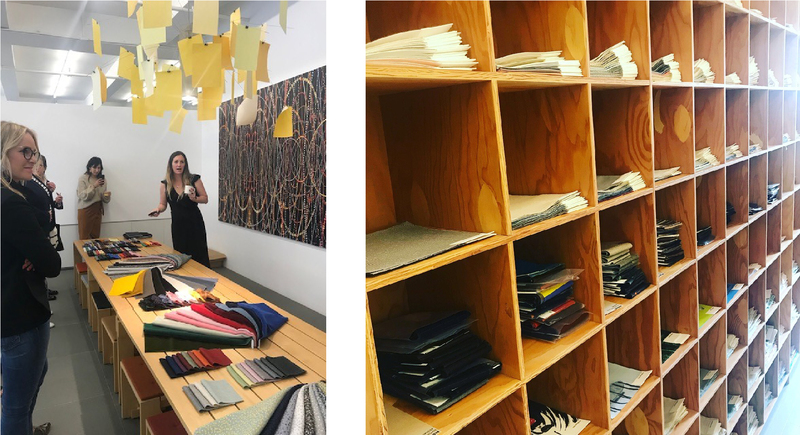 After shopping, we toured the Herman Miller offices; got to try out their newly launched task chair, the Cosm; and then were led on a tour of Maharam to see how they operate, get a glimpse of their sample library, and get a sneak peek at some of their new collaborations. I needed to stay in NY a couple more days to absorb it all, but I had to get back. I feel now that ICFF is a must, at least every other year, though I’d love to go again right away in 2019. 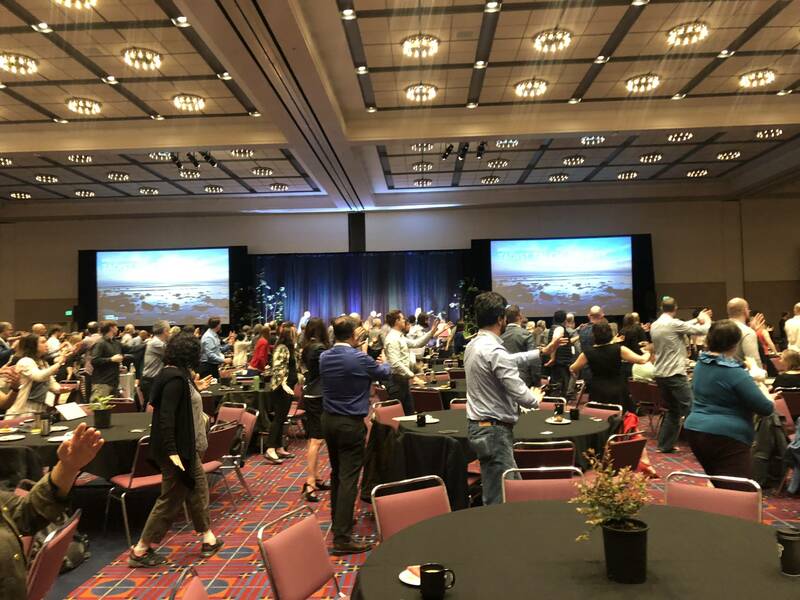 Not only was it an opportune way to see so many products in person, it was great to meet up with so many SF reps and designers 3,000 miles away!